July 12, 2006 | If you have a few days to kill this summer and are looking for a road trip, Mesa Verde National Park can be an interesting and educational experience. Mesa Verde National Park is in southwestern Colorado in the Four Corners area. From Logan it is about a seven-hour drive. You drive through Moab so if you want, you can stop off at Arches National Park and see that arch on the Utah license plate (Delicate Arch) along with many other famous and breathtaking natural arches. There are some trails to hike and some wildlife to be seen, but Mesa Verde is most famous for its cliff dwellings. According to Mesa Verde's Web site, there are more than 4,000 known archaeological sites within the park, 600 of which are cliff dwellings and many of which have not been excavated. 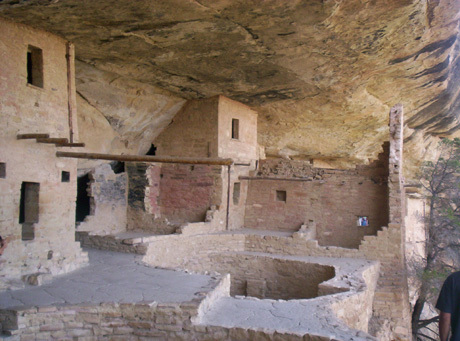 The area was inhabited beginning in about the sixth century with most of the cliff dwellings being built from the late 1190s to the late 1270s. You may have heard of the people referred to as the Anasazi. However, according to Wikipedia, there is still some debate over what to call them, since Anasazi is a Navajo term meaning "ancient enemies." The more preferred or politically correct terms for this group of people seem to be Ancient Puebloans or Ancient Pueblo people. They are believed to be the ancestors of modern Pueblo peoples, some of whom are the Hopi, Acoma, Taos and Zuni. According to Mesa Verde's Web site, the people who built the dwellings of Mesa Verde farmed corn, beans and squash on the mesas above the alcove-like cliffs in which they lived. They also hunted deer, bighorn sheep, rabbits, squirrels and other animals. They domesticated turkeys, which they used as a source of food, and used the feathers in making clothing and blankets. Other sources of food included juniper berries and pine nuts. One of the dwellings you can tour is Balcony House. It is suggested by some archaeologists that Balcony House may have been used as a defensive location and was likely one of the last locations occupied by the Ancestral Puebloans. To enter balcony house you must climb a 32-foot-tall wooden ladder and to exit you must crawl through a narrow tunnelabout 12 feet long. It can be a tight squeeze for large people; you can find a virtual tunnel at the visitors center to see if you can fit. The difficult means of access is one of the reasons why it is believed to have been used as a defensive location. Cliff Palace is the largest of the dwellings in the park, and is also thought to be the largest in North America, it is estimated that somewhere between 100 and 150 people lived at Cliff Palace. According to Wikipedia, 220 rooms have been identified along with 23 kivas. The kivas are round subterranean structures which were used for religious and other communal purposes. It is uncertain why Mesa Verde was abandoned, no evidence has been found to suggest violence. Evidence of violence has been found at other sites within the area which has led some archaeologists to speculate that they may have been aware of this violence as they were active traders with other groups in the region. An extensive drought which caused food supplies to dwindle is another theory of why the people migrated away from the area. This year marks 100 years since Mesa Verde was made a national park by Teddy Roosevelt on June 29, 1906. Since this year is the centennial they are celebrating by hosting many special events, one such event took place May 23 when first lady Laura Bush visited the park and gave a speech. To enter the park costs $10 per vehicle. There is a $3 per person per dwelling fee to tour Cliff Palace, Balcony House and Long House. Self-guided tours of Spruce Tree House and Step House are offered at no charge. One of the park rangers said they require guided tours as a way to help protect and preserve the delicate dwellings. If the size of the groups was not controlled and if some of the people themselves were left unsupervised the dwellings could not remain as well preserved as they are at this time, the ranger said. Aside from being a national park Mesa Verde is also listed as a United Nations Educational, Scientific and Cultural Organization (UNESCO) World Cultural Heritage Site. The dancers pose outside a traditional dwelling.